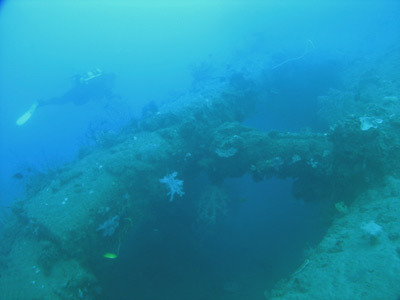 Michael McFadyen's Scuba Diving - Kinugawa Maru Two of the many vessels lost in the Battle of Guadalcanal in the Solomon Islands were the Japanese troop and supply ships Hirokawa Maru and Kinugawa Maru. 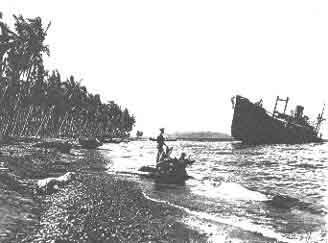 Located 13 kilometres west of Honiara near the Bonegi Creek, the wrecks are more commonly known as Bonegi I and II respectively. Both wrecks are only metres from the beach and are done as shore dives. The Kinugawa Maru was built in 1931 by Mitsubishi in Nagasaki for Toyo Kaiun K.K. It displaced 6,937 tons and was 437 feet long and 58 feet wide. Powered by two six cylinder Mitsubishi Jukogyo diesel engines driving a single prop (note sure about the two engines - very strange), the ship had a cruising speed of 13.5 knots and a maximum speed of 16 knots. 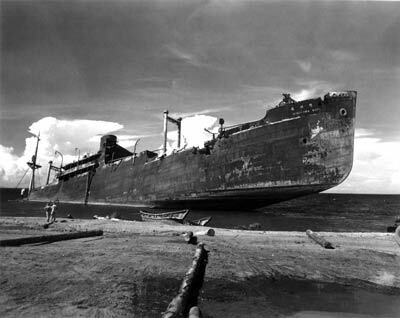 The ship was obviously used for normal cargo trade around the Pacific until shortly before the start of World War II. At some time it was taken over by the Japanese forces and then used in the move south towards Australia. 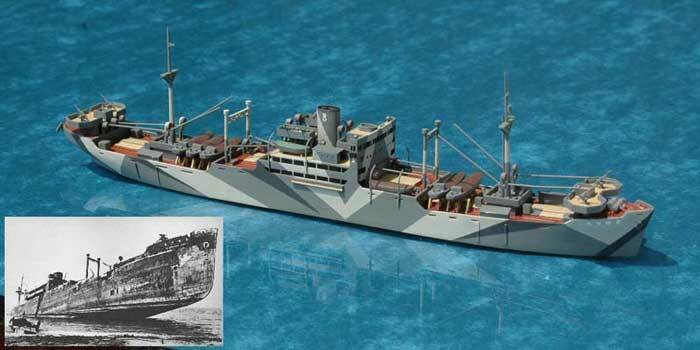 In late 1942 the Kinugawa Maru ended up being used as a support vessel for the Guadalcanal theatre of the Pacific war. 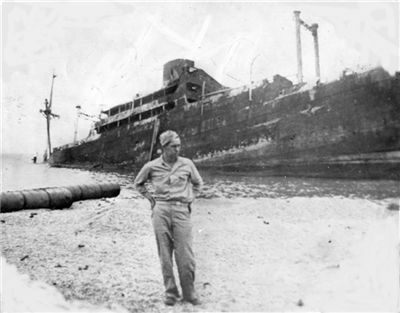 It is reported that the ship first arrived at Guadalcanal on 25 September 1942. 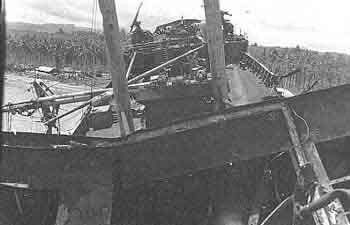 Some three months after the Americans (Marines, Navy, Air Force), Australians (Navy) and New Zealanders (Navy and Air Force) started their attack on Guadalcanal in an attempt to take back the Solomon Islands, the Kinugawa Maru was waiting near New Georgia in Papua New Guinea as part of a troop convoy. There were 11 transports and cargo ships and 12 escorting destroyers. The ships carried 10,000 troops, weapons and 10,000 tons of supplies. The convoy was sighted by a patrol plane at 0830 on 14 November 1942 about 150 miles from Guadalcanal. 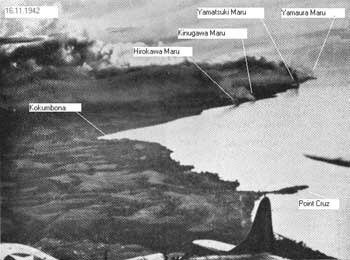 Planes from Henderson Airfield on Guadalcanal and the USS Enterprise attacked the convoy, sinking seven of the tranports with another two damaged. The remaining four transports continued on towards Guadalcanal. 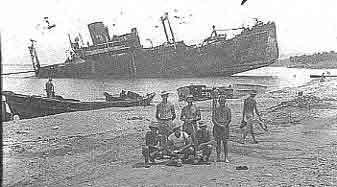 At dawn on 15 November 1942, the four transports were found by the Americans to be on or near the beaches west of the now location of Honiara. At 0500 field guns from the 244th Coast Artillery Battalion opened fire from west of Lunga Point. 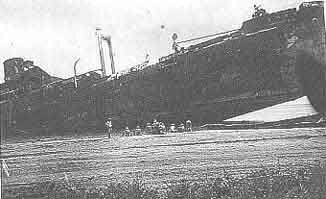 Even though they were 20 kilometres away, they hit one ship which began to burn (this was possibly the Hirokawa Maru. The 3rd Defense Battalion's five inch batteries opened fire at 0545 and hit a second ship about 16 kilometres away. This ship also caught fire and listed to port. The destroyer USS Meade moved from Tulaghi and shelled the these two ships. Planes from Henderson and the Enterprise attacked the two remaining ships. By noon, all four ships were on fire and sinking. Three were ashore and the fourth sank off shore. As a young man I flew dive bombers on the USS Enterprise. On November 14, 1942, I found the Jap fleet and laid a bomb, the last one to hit the Kinugasa, after circling the fleet for over an hour while sending contact reports. The Kinugasa thereupon sank. 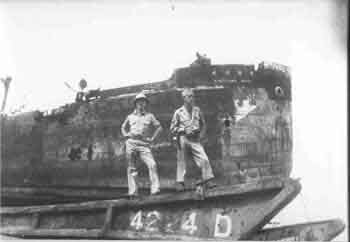 Right after noon that same day, on a flight with Marines from Guadalcanal, I bombed the Brisbane Maru hitting it midships and saw it break in two and sink immediately. 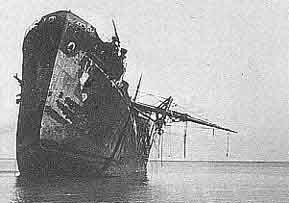 The next morning I bombed the Kinugawa Maru and it blew up, and out, with a blast coming out the side as well. I took photos of all three ships, and the one you show smoking is the Kinugawa Maru. Another of my pictures that was featured in Life Magazine shows all four beached ships and another SBD flown by my wingman. Bob died on 1 March 2002, aged 85. He had been awarded the Distinguished Flying Cross, the Bronze Star, the Air Force Commendation Medal with Oak Leaf Cluster, the Legion of Merit with Oak Leaf Cluster and the American Defense Service Medal for his actions during the War. He ended service as a Colonel. 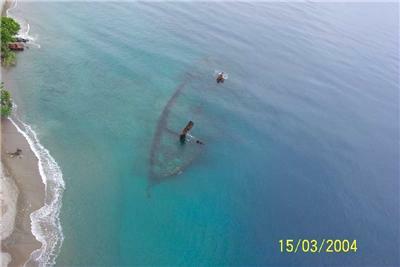 Originally the ship was stranded right up on the reef but over the years it moved back down the reef and then broke up under the effects of storms, rust and some Australian salvage work (in the 1960s). 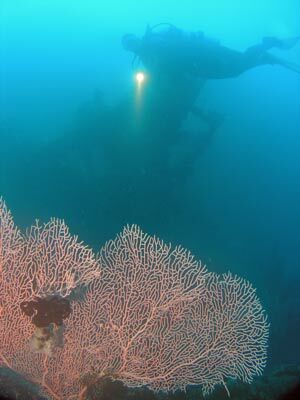 It is reported that the Australian salvage diver, Wally Gibbins, salvaged the prop of the "Bonegi". I know that this was not the Bonegi 1 (as it was salvaged by Brian Bailey). Therefore, it is possible that it was this ship, known as Bonegi 2. Nowadays, the shallower sections of the ship are pretty well broken up while the deeper parts are almost complete. 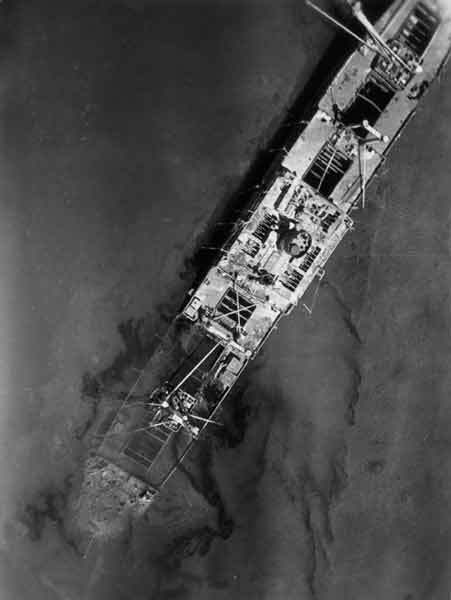 In the aerial photograph taken in 2004 the bow section seems to be still in the shape of a boat, but from my memory of my dives in 1992, the bow really did not exist as it looks in the photo. In 2009 the bow is virtually nonexistent, only scattered remains exist. This section is about five metres deep with the main attraction being the fantastic coral and fishlife. 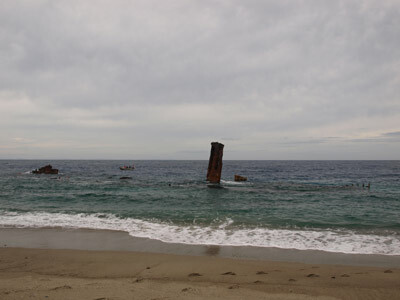 Today the bow section of the ship juts out of the water only 880 metres to the north of the Hirokawa Maru and only a few metres from the shore. A GPS Reading of S9° 22' 43.8" E159° 52' 12.8" (using WGS84 as a datum) puts you on the beach in front of the wreck. I believe that you need to pay a fee to the custom owners of the land to enter. There is a small parking area and shade from trees. Once you have geared up, you walk to the water's edge and once in, swim out till you are near the wreck. Descending here, you can see the remains of the bow section. The side of the shallow section of the hull is diveable but the inside here is not accessible. The back part of the bow can be dived as the hull has fallen away giving access. You can swim along inside the wreck here, but you will come to a bulkhead that bars further progress for most people (smaller divers will be able to squeeze through - I could not). You can go around this and then continue on. The depth here is about six metres. Once you are past here, you will see the engine. 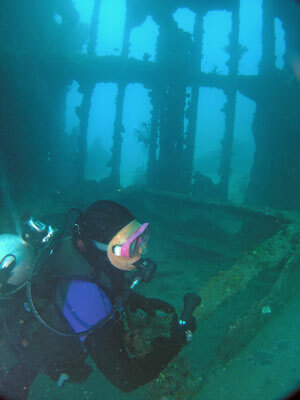 The front part of the wreck is basically upright but the stern section is tilted over at about 45° to the port. 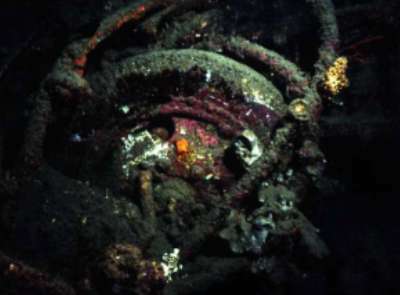 The stern section is slightly separated from the bow and lying in a different direction. As you approach the engine you can swim on the right side through the upper levels of the holds. This will eventually bring you out near the stern. The depth drops from about 8 to 10 metres near the engine to over 27 metres at the stern. Further down, the stern is more intact, although sections have been badly affected by bombing and corrosion. Once you exit near the stern, head around to the bottom of the ship. Here you will see the propeller shaft and rudder. The depth of the shaft is about 21 metres and under it the depth is about 24 metres. You can get an excellent photograph of the shaft from underneath. After looking at the shaft and rudder, head back to the stern. 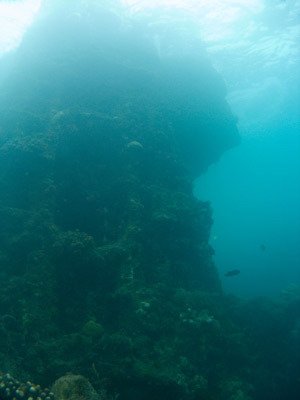 You can also get a good view of the stern from the sand off the wreck. From here, you can enter the rear hull under the stern and the rear holds. These are mostly empty, but in the rear-most hold there are the remains of a truck with the front axle and left wheel visible. From here you can do some interesting swim-throughs and penetrations as you pass inside the wreck back towards the engine. Back up near where the wreck is split into two sections, the engine can be seen on the western side of the wreck. The engine is huge, sticking up well out of the water. About level with this, the funnel can be seen on the east side a short distance off the wreck. There is also another object here (not sure what it is). 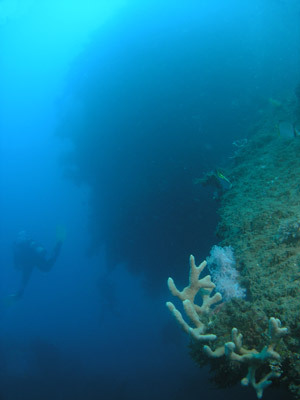 Like the nearyby Hirokawa Maru, the shallower sections abound with coral and fishlife. There is so much coral that it can be impossible to see in some places what is wreck and what is not. You can spend a very long safety stop in this area without getting bored. This is a good dive, well worth doing, even if you are not a wreck addict. 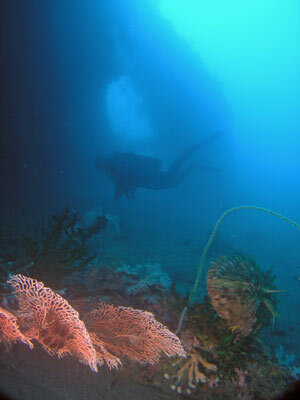 The water on these dives was pretty clean with about 18 metres visibility. In August the water temperature was 27 to 28 degrees and does not vary too much from this. Although these wrecks do not have the intactness or artefacts of the Chuuk Lagoon wrecks, they still make excellent dive and are a very good (and cheaper) alternative to those wrecks. 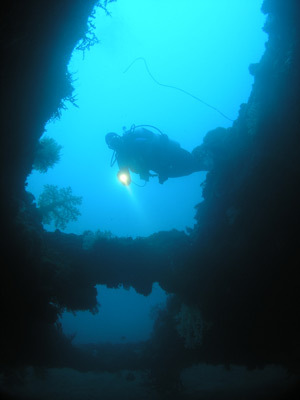 Other advantages of Honiara diving includes the closeness to Australia, the (far) cheaper accommodation, food, drink and diving and the very good exchange rate between the Australian and Solomon Islands dollars. One big advantage for people with non-diving partners and children, both these wrecks (and some of the others) can be snorkelled. 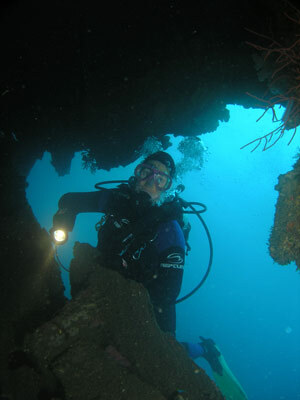 In summary, the diving in Honiara is very good and I can certainly recommend it.